Companies are shifting from selling devices to building long-term service relationships with millions of consumers and businesses. Monetizing these relationships requires a solution that knows how to price, bill and recognize recurring revenue for complex hardware / software packages. Service Event Management: Device notifies the billing engine when service is nearing expiration or has expired to trigger service billing events. Usage: Billing Engine captures device on/off data to ensure analysis and billing of usage data. Inventory Management: Inventory platform validates that the products & services being subscribed to in your billing engine are available. Physical Delivery: Your billing engine manages user account information including shipping address enabling the shipment of hard goods. Warranty: Entitlement application or CRM stores subscriber entitlements to validate the purchase and terms of extended warranty on devices. 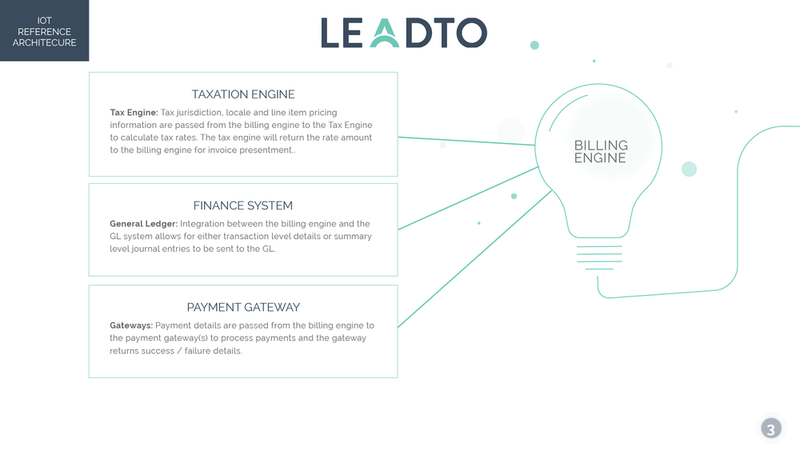 General Ledger: Integration between the billing engine and the GL system allows for either transaction level details or summary level journal entries to be sent to the G.
The advent of the Internet of Things (IoT) has brought about staggering new revenue opportunities. Capitalizing on these opportunities is vital to staying ahead of your competition and expanding your business in the future. LeadTo enables companies stay ahead of the curve and seize entirely new market segments through product iteration and new opportunity enablement.